We spoke with visual artist, Lina Viktor, about the various expressions of womanhood in her art. This feature is in conjunction with our inaugural list—“OkayAfrica’s 100 Women”—where we take a look at the women making an impact on the African continent and in the diaspora. Check out the biggest names in culture to young up-and-comers in "OkayAfrica's 100 Women" list here. The work of artist Lina Iris Viktor mesmerizes with a selective yet striking palette of black, blue, white, and her trademark, 24-karat gold. 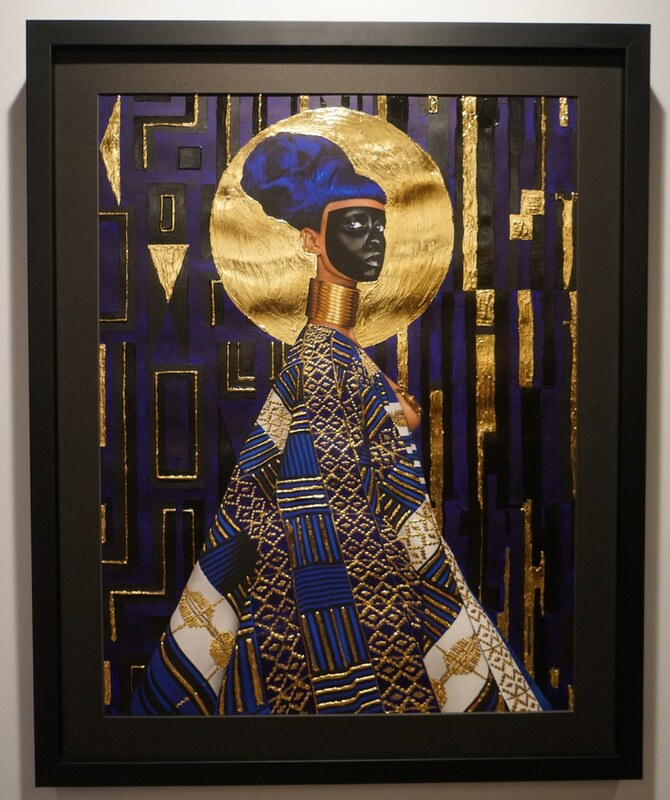 While the stark hues and the shimmer of gold are alluring, the relevance of her work to black womanhood, history and identity seduce even more. Viktor blends together careful geometric patterns that demonstrate her sensibilities of mathematics, science, philosophy and her interest in the ancient Egyptian civilization. In some of her paintings Viktor covers her face so that only one, perfectly outlined eye is exposed, creating an image that calls to mind the Eye of Horus. In other paintings golden orbs and celestial patterns add elegance and drama. Her work, then, is rooted in the past but with a nod to a futuristic expressionism. Her paintings are a multiverse in their own right. Most paintings show Viktor as the sole figure, standing before an ornate galaxy-like pattern. Viktor’s posing, usually accompanied with serene facial expression, tells us the reaches of black womanhood are infinite. One painting, titled Syzgy, which shows Viktor with a gold halo amidst blue patterning, is named after a term that describes the alignment of the moon and sun. Her arresting presence places a woman of color central in a futuristic context which extends beyond the confines of the work’s ornate frame. In Yaa Asantewaa she mimics the royal pose of the Ashanti Queen whom the painting is named after, and updates the image with a cosmic blue pattern work. Viktor succeeds in placing black womanhood in the places we always know it exists—as seminal figures rooted in the past, affixed to the present, and unyielding in the future. The layered meanings behind her work mirrors the process to create it: a process that involves photography, digital enhancement, and painting. From producing artwork for Wu Tang Clan and collaboration on projects with Noirwave—Yannick Illunga (aka Petite Noir) and creative director Rochelle Nembhard—on the album La Vie Est Belle, Viktor is a multifaceted creative talent. She is also a humanitarian: In December 2016, she collaborated again with Noirwave on a project for United Nations Population Fund, where she spoke to young women on the importance of reaching for their dreams. Viktor, who was born to Liberian parents, originally studied performance and theater. She currently works from her studio in New York City and has exhibited in Boston (at Harvard University), Johannesburg, Lagos, and London. Her paintings have also exhibited alongside work by Jean-Michel Basquiat and Andy Warhol. For #OKAY100Women, OkayAfrica caught up with Viktor to discuss her art and Afrofuturism—the genre her work is often placed—how traveling the African continent inspires her and her definition of a powerful woman. Nadia Sesay for OkayAfrica: When did you become interested in the outward expression of the connection between math, science, and art? It was a very natural progression to take my core interests around these subjects into the visual realm. I create in the same way I think—and I see the world and its goings on holistically. We as society seek to separate, divide, and compartmentalize everything into smaller, more localized parts. There is a space for those nuances within our society, however, to understand the macro conversations—the forest from the trees, if you will—is also very important. I see a world that is very interdisciplinary rather than fractioned—I see the similarities rather than the differences. Math, sciences art et al—all of these modes of thinking are reliant upon one another. You began your professional creative career in theater and then transitioned to art full time. Does the essence of performance linger in your artwork? After theater there was film, design, photography, and that landed me where I am as a visual artist. Each of these disciplines inform my work—especially performance as made evident through the portraiture work. You traveled to South Africa last year, with Rochelle Nembhard, on a trip that was beautifully captured on Instagram. What about South Africa is special? I spent my early teenage years in Johannesburg so it is a return to a home for me. South Africa has many ties to America socio-politically, and many indirect ties historically. More so than anywhere else I have visited on the continent, I feel the bonds that tie Africa to America there the most due to what I view as a parallel colonial past of indoctrination and subjugation of a people. The only difference is that one happened on foreign soil, and the other on native soil. The side effects, though separated by centuries is felt the same. What other places on the African continent inspire you, and in what ways? I am West African—a lot of my inspirations are taken from that region. I study the Dogon of Mali. However, I look a lot to East Africa—namely Egypt for some type of historical grounding for my work. I am spending more time in conversation with Yannick Ilunga and Rochelle Nembhard on the current socio-political situation in the DRC as well— there will be work created around that narrative soon. no.14 / dark continent series on view @marianeibrahimgallery january 25 - march 25. 2017. back stories. a triptych - nos. 9, 13, & 14 on view. How do you define beauty? Do you consider your work to be beautiful? Beauty is not to be defined—it is wholly subjective at its core, no matter what contemporary societal norms dictate. My idea of beauty is ever evolving. Within my work I use beauty as a tool to transfix the viewer—and then invite them to look a little deeper beyond the veneer of things. Is creating self-portraiture, especially when you are pictured in gold, an act of empowerment? I don’t view my work as self-portraiture—it is form—universal if you will (at least to over 50 percent of the world population). My work is an abstraction of self—an obliteration. But yes, those portraits whether viewed as me or not are defiant—they are an act of defiance and in there lies something that is empowering. It controls the gaze—demands respect. In one painting you replicated the image of the coronation of Queen Elizabeth I. You titled another painting Yaa Asantewaa. How do these women relate to you? I am, we are all every woman. The position of women within this patriarchal construct that has been in place for the past millennia transcends time and race. Women in positions of power are more often than not vilified before they are heralded. It takes time to herald that which is contrary to the popular opinion of the day. Joan of Arc was burned at the stake, now she is a saint—history is always biased in that way. All women that dream of being more than what is prescribed to them share a commonality. In your opinion, what is the definition of a powerful woman? A woman who knows herself. But then, that applies to all people. There exists nothing more powerful than a person who knows themselves and is willing to stand in their truth unapologetically. What is the relationship between your art and your identity—as a woman? As an African? Do other categories capture your identity? My work is in direct conversation with my experience—and I have experienced the world as a human being first. Depending on the day, my womanhood or my African-ness can take center stage but neither are a permanent thing or necessarily a point of departure. Speaking of categories, you reject the label of "Afrofuturist" for your artwork, although it is often described as such. Most recently, in response to an article from the New York Times you said, on Facebook, "I do not regard my work to be Afrofuturist, however, it is a language we are always creating to re-envision a space we can rise within." Can you explain how your art is language? I use language in my work through symbols—the translations being more vague give people the opportunity to feel and intuit a meaning rather than translate a singular reading. My work is full of codes, strains of knowledge and thought of the past mixed in with my own. But then we could argue that all art is language with several meanings and readings—all of which are correct and incorrect simultaneously. Who are some female artists you admire? Kara Walker, Louise Nevelson, Carrie Mae Weems. Who is your African woman of the year? the ghosts of men i’ve loved are mirror reflections of former selves. each broke me down so i may build strength. the hurts they inflicted my victory scars. i’ve outgrown them all. my garden continues to flourish in their memory. _______________________________ tracings of new work in development. Nadia Sesay is a Sierra Leonean based in Washington, D.C., traveling the world to indulge in art. She is Editor of BLANC Modern Africa, a magazine on contemporary art and culture inspired exclusively by Africa and its Diaspora.